Drinking certain herbs in the form of tea is an effective method to shed unwanted pounds and control hunger. While herbal teas are natural and offer many health benefits, moderation is key. Consuming too much tea, especially on an empty stomach, may have negative implications, such as dizziness or diarrhea. For this reason, consult with a health professional before engaging in appetite-suppressing activities. Green tea aids the body in metabolism and energy expenditure. According to a study conducted by Abdul Dulloo of the University of Geneva in Switzerland, green tea helped participants experienced a four percent increase in energy expenditure as well as an increased rate in fat oxidation. To make green tea, which may be found at your local grocer, simply steep one teabag per 1 cup of boiling water for 5 to 10 minutes. In addition to curbing cravings for sweets, dandelion is also reputed to boost metabolism, flush out the kidneys and treat digestive problems. The dandelion root, either fresh or raw, may be used to make tea. Simply boil 2 or 3 tsp. of the root per 1 cup of water for 10 to 15 minutes. It is most effective when consumed three times each day. Fennel may be a natural appetite suppressant as it effectively removes mucus and fat from the intestinal tract, according to Holistic Online. 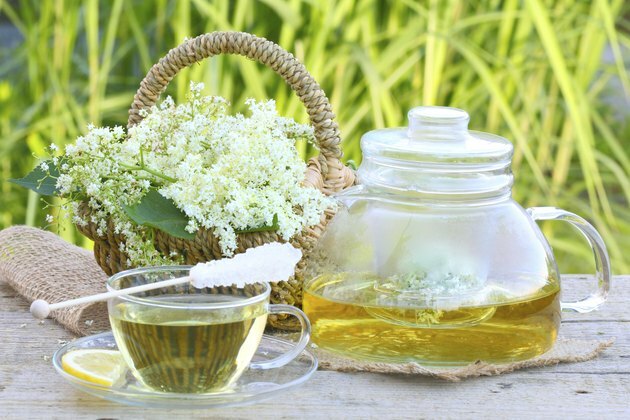 Not only does it function as a diuretic, but it also contains antioxidants, potassium, magnesium, calcium and vitamins B and C. To make fennel tea, simple steep 4 tsp. of fennel seed per 2 pints of boiling water for 5 to 10 minutes before consumption. Licorice, otherwise known as "sweet root," sustains a healthy blood-sugar level and reduces cravings for sweet products. The licorice plant may be found in Europe or Asia and typically grows between 3 to 7 feet tall. The roots may be dried and peeled to make tea. Siberian ginseng helps to stabilize blood-sugar levels which in turn controls cravings and suppresses the appetite. Although there are many benefits to consuming Siberian ginseng, people with a history of high blood pressure or anxiety must limit their consumption of Siberian ginseng or find other natural alternatives to suppress their appetite. This type of tea is commonly found in Asian grocers or herbal shops. While many herbal appetite suppressant teas are safe for consumption, there are some that require caution. Some herbal plants contain biologically active substances that may be detrimental to your health. Ephedra is one example of an herbal appetite suppressant that has been banned by the FDA for use in weight loss supplements. Before embarking on a weight loss program, research authoritative studies on a variety of herbal teas beforehand.